Commit a series of conspicuous safebox robberies. Rumors are floating around that the Thieve's [sic] Guild isn't a threat anymore. The Thieves Guild wants to quash the rumors with a series of conspicuous thefts. Read the Tip Board in the Thieves Den. Break into a safebox in the indicated zone. (Optional) Break into a safebox in a second zone. (Optional) Break into a safebox in a third zone. Return to Kari in the Thieves Den. "Rumors that the guild isn't a threat are starting to gain credence. A good string of safebox robberies ought to dispel that myth real quick. If you've got deft fingers, put them to work!" Your task will be to break into any safebox in the indicated areas of a specific zone. For possible locations, see the safebox article. 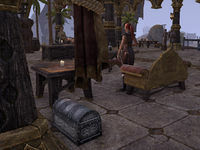 It's important to note that safeboxes will disappear if looted by someone else, placing you in direct competition with other thieves or players attempting this quest. Once you have opened a safebox, you will be given the option to continue the crime spree by breaking into safeboxes in an additional two zones, or return to Kari. When you are ready to report back to Kari, return to the Thieves Den. She will reward you according to how many safeboxes you decided to empty. The areas vary, but are always within the same alliance territory and the area order always follows the area difficulty, starting from the easiest. For example Grahtwood -> Greenshade -> Malabal Tor, or Auridon -> Grahtwood -> Greenshade. Looting the opened safeboxes is optional, and it may prove prudent to leave the objects behind in order to minimize your bounty if you've been caught in the act. The quest will show circles around the major cities and towns in the zone, but these are only a suggestion. While the cities will have the most available safeboxes to choose from, they also tend to have more potential witnesses. Any safeboxes found anywhere in the zone will qualify, and those outside of major settled areas may be easier to break into undetected, or will at least give an easier means of escape if you are in fact spotted. Safeboxes found outdoors are generally easier marks, as you can easily flee if caught. If you are caught indoors, some NPCs will attack you, and you may find yourself unable to leave the building without resorting to murder and earning a much higher bounty. I need to break into a safebox somewhere in <area> to start the crime spree. With one major theft down, I can call this accomplished... or I can knock over another safebox in <area>. With two major thefts, I can call this accomplished... or I can knock over another safebox in <area>. Finishes quest I've pulled off a string of thefts to boost the Thieves Guild's notoriety. I should expect more than a pat on the back when I get back. This page was last modified on 6 December 2017, at 20:28.